Dubai Desert Safari leads at Top 3 Attractions in the United Arab Emirates. No doubt about that among countless entertainment activities offered by Dubai, Dubai Desert Safari has proven its excellence in services & capturing the hearts of millions of tourists worldwide. Dubai Desert Safari is the mainstream tourist magnet in Dubai. A huge number of tourists and visitors come to enjoy Desert Safari every year. 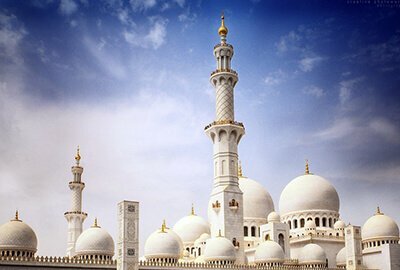 This tour is a stand-alone champion of amusement and pleasure in all the glitter of this fabulous charming Dubai city, as it provides a full day of fun and thrill in unique Arabian style for the whole family and for every age. In addition, these vibes will stay with you in the form of beautiful memories. 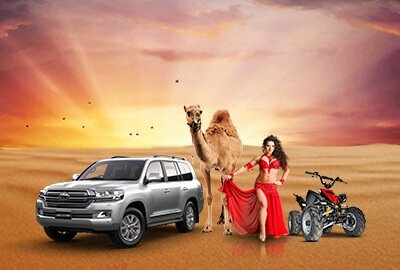 To begin with, Dubai Desert Safari starts with a comfortable pickup facility in our air-conditioned vehicles from your home, office, or centralized location, it depends upon the type of package you booked for. You'll be drop on the road-side after leaving the magnificent scenery of the city behind the sand dunes. Our very friendly but highly professional team will warmly welcome you to the adventurous world of Desert Safari on the road-side, where land cruisers will be ready to take you deep in the heart of this huge Arabian desert. Cross and feel the natural beauty of Dubai Desert and test your adrenaline while driving on the top of Red Sand Dunes with our expert drivers, following Global Safety Standards. In the local language, it called Sand Dune Bashing or Dune Driving, where you get to ride in 4WD while our driver shows you his feats and skills. By going up and down and doing zigzag on top of the thin edge of huge Red Sand Dunes at a very fast speed. As a result, you'll experience adrenaline rush pumping in your veins. Safety is our top most priority concern to satisfy your event experience. Our drivers are professionally trained so you have the most fun out of it while making sure that your safety is intact. Once you did Sand Dune Drive, interact yourself with the "Ship of The Desert" by Riding The Camel and feel like a traditional and ancient Arab traveler. These human-friendly giants have been very significantly important for Arabs because they were being used for traveling across the deserts long before 4x4 cruisers. Take some beautiful pictures with this calm and amazing creature to share on your social media. Moreover, you can also unleash your adventurous side by riding a quad bike on the golden sand of the desert. You can also do Sand Boarding which is a same extreme sport like snowboarding but is carried out on sand dunes rather than snow. And if you like more animal interaction, you can ride on our tamed and beautiful horses and show your friends that who's the boss by posting it on your social media timeline. In addition to spending a whole day of thrilling and fun activities, you'll get to see enchanting and mesmerizing desert sunset in the evening. At night, Sit comfortably on traditional Arabic Carpets and rejoice the vivid and amazing world-class live show such as Tanura Dance, Fire Show, Arabic Halla Dance & unique Puppet Play for children. Above all, get to see alluring Belly Dance by gorgeous and ravishing dancers & end your night at the Desert Safari Dubai Camp by being a star-gazer under the billions of sparkling stars, which is a very pleasant experience that it is beyond description. Due to many years of successfully providing excellence of services, As a result Dubai Evening Safari has proven its name by providing smooth and memorable tours to millions of tourists from around the globe. To summarize, as a part of Trip Advisor, We are the most recommended tour operator regarding exceptional Desert Safari experience. 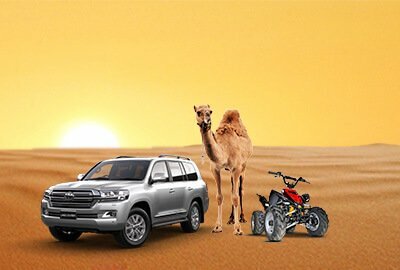 Wish you a very exciting Dubai Desert Safari event with your loved ones. Pick & drop from home/hotel/centralized meeting locations. Depends upon package type. Dune drive in Toyota Land Cruiser, climb up onto sand dunes then slide dive until nearly ground, again climb up without touching the ground. Ride on camels, the ancient friend of Arabs. Ride at their hump & take video or snaps for your Instagram/Facebook/Snapchat Feed. Enjoy sandboarding, similar to snow-boarding & feel your adrenaline while taking a good shot at sand dune edge. One we done outside activities, its time to head in Bedouin-style camp. Inside you can adopt the rich culture of the ancient Arabic themed atmosphere. Have warm welcome drinks like Arabic qahwa, coffee, tea & unlimited water packs as you arrive in the camp area. Feel as a classical Arab person by wearing Arabic dresses & get pictures To "WOW" your social circle. Henna is the natural paste of a plant called Lawsonia Lnermis. It is used in Arabian culture to texture hands, arms and feet. Show your artistic side by making Henna painting on your hands and arms. It has a very refreshing fragrance and lasts for 2 to 3 days. Be captivated by 5 live entertainment shows, such as Belly Dance (2 Shows), Halla Dance, Fire Show & Tanura Dance. Savour yourself with buffet meal for both vegetarian & non-vegetarian with the Grilled BBQ, Salads & Arabic Dishes. 15+ Varieties without any additional cost. It's Very Big Desert, So Let's Go with Big Safety. 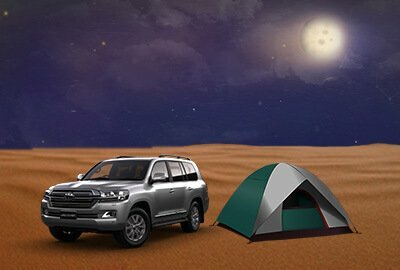 Dubai Desert Safari provides services in Safety Equipped Land Cruisers with more protecting frame structure from inside to ultimately reduce surprised chance of risk while driving at the edge of sand dunes. "Dubai Desert Safari" is awarded 2 times due to its safety standards & no compromise on supervision of services. So, fill-up your memories with this wonderful and adventurous Desert Safari but absolutely risk-free experience. With / WithOut Ferrari Word Option, Upto 7 Visiting Places, Souq, Dates Market, Shoping Malls. 100's Off: Cheap - Discounted % - Buy One Get One Deal, Over the Internet!! But Only Buy The Perfect "Desert Safari Deal"
Be Aware of Agents & 3rd Parties. They are selling the same packages with similar prices & poor services to gain their commission in Desert Safari, they deduct from you and pay less to Desert Safari providers. Tip No 2: Most Important ! Make sure you are about to join with a self-organized tour provider. 3rd parties & small companies are lower in business & they hire freelancers at cheap prices, that always come late for pickup. They can't explain you accordingly due to poor communication skills. They nickel-&-dime you for trivial things during tour activities to get more & more commission. They hold unauthorized cars & believe us or not, many drivers even don't have a valid Driving Permit for Desert Safari. 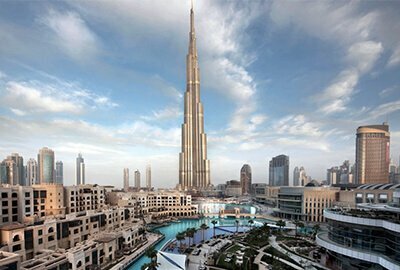 Try to get more in less like you can go with Dubai City Tour and take benefit of Dubai City Tour with the possibility to snap fantasies with sky touching landmarks like Burj Khalifa & Burj Al Arab. If you are an adventure fan then the 1st choice of Adventure in Dubai is Desert Safari Dubai with a full live performance arrangement, BBQ & more activities without paying an extra cost. Enjoy under billions of twinkling stars while saving your budget with Overnight Desert Safari the best alternative & better option than spending on costly hotel stay. Please yourself with night stay in Dubai Desert with sleeping bags & tents after entertaining yourself by live shows & traditional atmosphere, with Arabic food & BBQ Dinner.